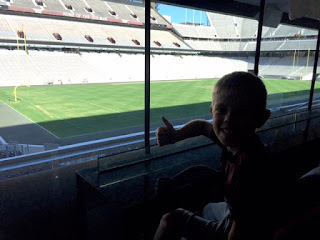 My Texas Bucket List began taking shape shortly after we arrived in College Station. At first the list consisted of only a few touristy day trips and experiences - like Sea World and Six Flags - I'd thought of or heard about prior to our move. But as we made new friends, especially new friends who grew up in Texas, we learned from them about the lesser-known - at least to Midwesterners - but not-to-miss sights and sounds of the Lone Star State. For the last three years, our elementary school's PTO - which I support as Board Secretary, Fundraising Co-Chair, and a few other "odds and ends" positions - has put on a large fundraiser midway through September. This fundraiser, coordinated in partnership with a company called Boosterthon, focuses on physical fitness and character development above all else; the fact that we raise money while helping our students become healthier, stronger, more confident, and kinder is a bonus. 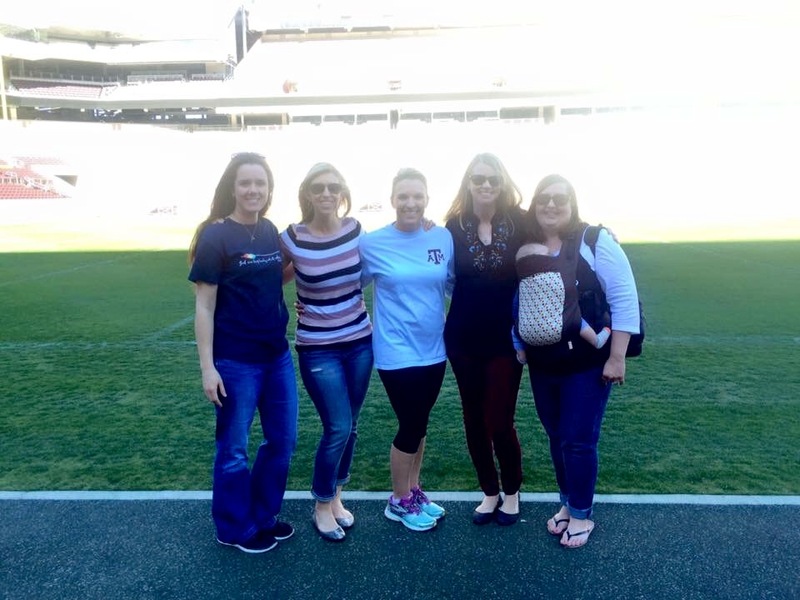 The Boosterthon company plans to open a branch office in College Station this fall. (In past years, Boosterthon staff members from Houston have come to our area to help us run the program.) 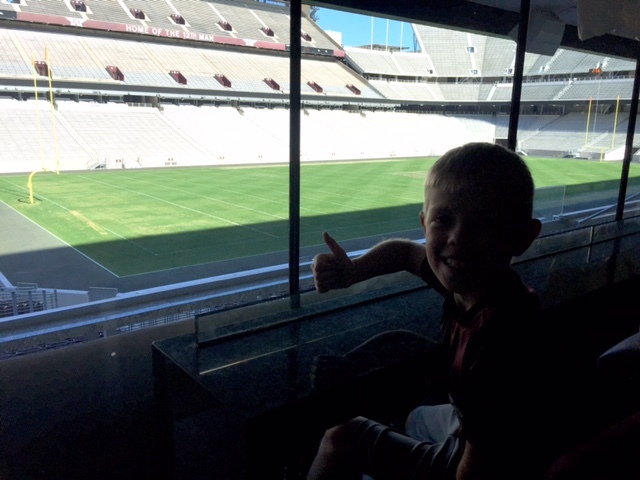 To get all of the CSISD PTOs - those already participating as well as those interested in participating down the road - together for a little networking ahead of the opening, they set up an incredible afternoon tour of Kyle Field. I have yet watch a regular season Aggie football game at Kyle Field. 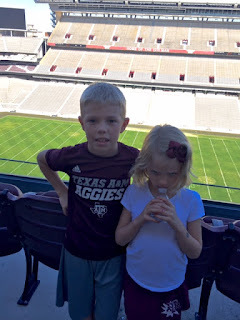 (We attended a local high school football showdown and an Aggie spring football scrimmage at Kyle Field, but neither officially met my Texas Bucket List requirement.) And while this tour didn't allow me to cross that bullet point off my bucket list either, it did allow me to experience the stadium in a way I won't likely ever have the opportunity to do again. Our behind-the-scenes tour took us through the Hall of Champions, Presidential Lounge, and a few of the suites and boxes, and while we couldn't enter the Legacy Club, we had an opportunity to admire - from "our" side of the velvet ropes - the luxurious and elegant space. 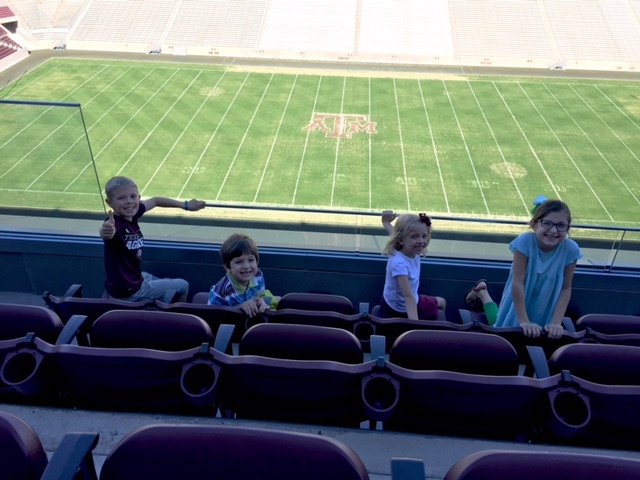 We took in the sweeping views from the top deck, and stood up close and personal next to the beautiful grass on which the Aggies play their hearts out on Saturdays each fall. At every turn I thought to myself, "well, it's safe to say I won't stand in this spot ever again!" 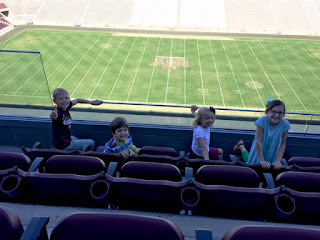 I'm grateful to Boosterthon and my affiliation with PTO for affording Will, Hallie, and me to opportunity to experience a piece of College Station and TAMU that I would have otherwise known only in my imagination. Another day, another experience, another picture of Hallie looking as though her parents have ruined her life. I wouldn't have it any other way. Note: this is not a sponsored post. I have no relationship or affiliation with Boosterthon other than being a satisfied customer.